Miami Springs starting pitcher Erick Argote went four innings on Wednesday, striking out five. 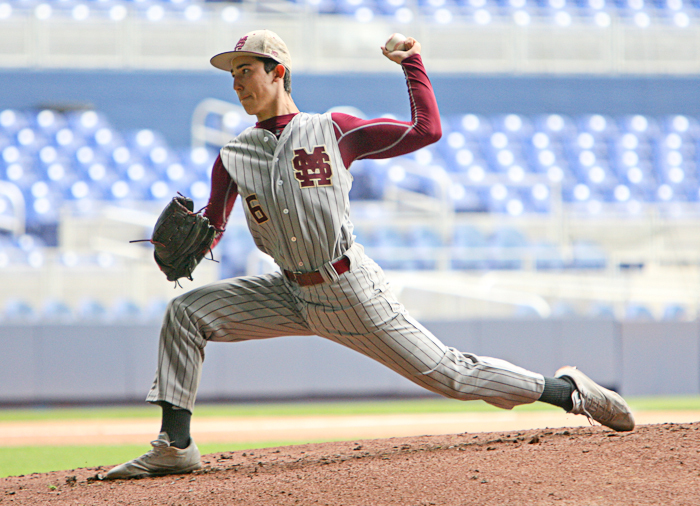 In a game that was as good as the venue that hosted it, Miami Springs held off Hialeah Educational, 3-1, on Wednesday morning at Marlins Park. The roof was open to a cloudy start of the day, but that certainly didn’t dampen the spirits of the two non-district foes who gained the experience of a lifetime playing at the Major League ballpark. Freshman first baseman Jason Torres hit a home run, one of his two hits, and scored twice to provide enough offense for a trio of Golden Hawks pitchers who combined on a one-hitter as Miami Springs remained undefeated at 13-0 for the season. Lefty starter Erick Argote worked the first four innings, striking out five, and the Hawks got three innings of no-hit relief from Jesus Gonzalez and Brandon Villabrille. Gonzalez struck out two in two innings of relief to pick up the win, and Villabrille finished it out with a perfect seventh inning, striking out a pair of Bulldogs. Argot said he was able to lock in and make pitches that were called for by his catcher Nicholas Fuentes, whose two-out, two-run sixth-inning double made the difference in the game. Still, there’s just no way to escape the butterflies of playing in a Major League ballpark. Argot said he sings to himself when he gets nervous. What song was he serenading himself with? But his best memory wasn’t his pitching performance. Torres’ second homer of the season came in the second inning, a no-doubter into the Hawks’ bullpen beyond the left field fence. “Best feeling I’ve ever had,” Torres said. “I look for these moments. I feel like I’m a Big Leaguer, turn on a pitch and hit it about 350 (feet), best moment ever,” said Torres, who believed it was gone from the moment it left his bat. 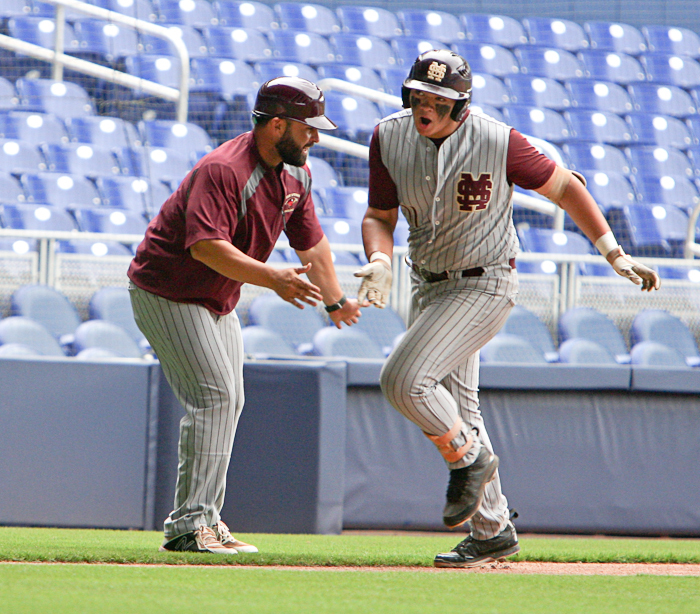 Miami Springs freshman first baseman Jason Torres rounds the bases on his home run at Marlins Park. The solo blast gave the Hawks a 1-0 lead and allowed Torres and the team to exhale from the emotions that were running high. “He hit the home run and kind of lifted a weight off of our shoulders,” said Miami Springs manager David Fanshawe. But the Bulldogs were able to tie it 1-1 in the fourth inning when Carlos Castillo made the team’s lone hit count. 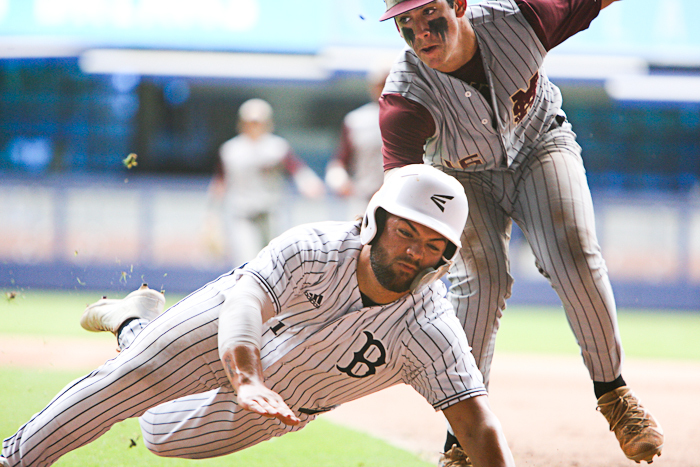 The Hialeah Educational Academy shortstop singled, stole second, moved to third on a ground out, and then scored on a balk to highlight his team’s experience at the Major League park. Baez said he felt it was an all around great experience. “The experience is not only with the baseball players but with the school,” he said. “Good support staff from our principal, our assistant principal that came out here and supported us today. The action was fast and furious at Marlins Park on Wednesday morning in Miami Springs’ 3-1 win over Hialeah Educational Academy. The game wasn’t decided until Fuentes’ clutch hit, a long fly ball to left field on the first pitch he saw in the at-bat. It truly was a memorable experience for all.